The Texas Commission on Environmental Quality has nearly doubled its number of administrative enforcement actions against polluters in the last five years — yet critics charge the agency still levies penalties too small to act as a deterrent. The most-cited polluter in Texas over the last decade was global juggernaut ExxonMobil, which was hit with 92 administrative enforcement actions by the Texas Commission on Environmental Quality — more than any other company operating in the state, according to records provided to The Texas Tribune by the TCEQ. Since 1998, the earliest year for which the TCEQ's electronic data is available, the agency has levied a total of more than 13,000 such actions and more than $140 million in penalties on entities big and small, its records show. In the same time period, the agency has pursued 520 cases through the courts for a total of $588 million in fines. The TCEQ has boosted the number of enforcement actions against polluters since being blasted in a 2003 state auditor’s report for slow, sloppy enforcement and low penalties that provided little incentive for compliance. From 2000 to 2004, it handed out an average of 859 enforcement actions per year. For the second half of the decade, that number rose to 1,544 actions per year, the agency's records show. But the TCEQ still faces criticism from environmental groups for levying penalties too small to curb pollution. ExxonMobil, for instance, has paid less than $1.5 million in fines since 2001, the agency's records show, or an average of just $158,000 a year — a mere pittance for a company whose annual revenues in 2009 were more than $19 billion. Environmentalists and other critics charge that with so little an impact to a polluter's bottom line, no real deterrent to future violations exists. “Fines are routinely less than the economic benefit of noncompliance,” says Luke Metzger, the director of the advocacy group Environment Texas. Questions over whether the TCEQ conducts enforcement with sufficient fervor take on increased significance as the agency last week became embroiled in a tussle with federal regulators over its role on the front end of the regulatory process: permitting. The Environmental Protection Agency last week stripped control from the TCEQ over one of its biggest permits — the fifth-biggest refinery in Texas, a plant in Corpus Christi owned by Flint Hills Resources — because the “flexible” permit the state issued does not meet federal anti-pollution standards. Specifically, the flexible permits give facilities a cap on total emissions but do not require the tracking of emissions by individual units within that facility, which may allow them to violate federal clean-air standards, says EPA regional counsel Suzanne Murray. The TCEQ’s enforcement data show that the Flint Hills Resources refinery was assessed about $62,000 in penalties for air violations since 1998, all between 2006 and 2009. A court settlement reached in April 2001 saw the company fined $20 million for several types of violations. The state’s top violators over the last decade, based on the number of administrative enforcement cases, consisted mostly of oil and natural gas companies, refineries and chemical companies. Debbie Hastings, the vice president of environmental affairs for the Texas Oil & Gas Association, says the enforcement figures do not suggest any problem with industry pollution; rather, she says, they suggest an admirable track record given the huge number of activities subject to regulation. Metzger says the persistent violations piled up by companies like ExxonMobil show the system isn't working. 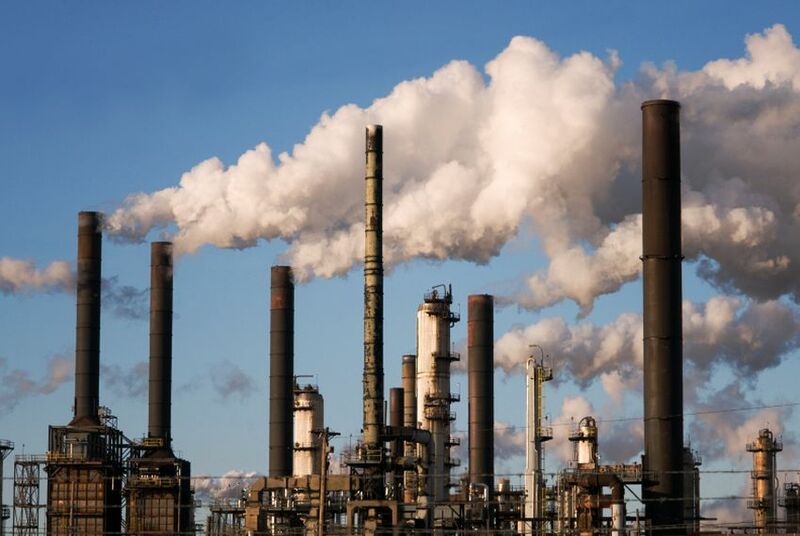 In one well-publicized 2009 case, ExxonMobil was fined $496,201 for 23 different emission violations between 2005 and 2007 at three Baytown refineries. In one 2005 emissions event, more than 1,000 pounds of ammonia, 263,000 pounds of carbon monoxide, 900 pounds of hydrogen cyanide and 11,000 pounds of sulfur dioxide were released into the air over about 17 hours, according to a TCEQ enforcement summary. The lack of a sufficient deterrent is but one of the complaints leveled against the TCEQ by its critics. Metzger maintains, for instance, that it can be difficult to know how many violations a company has committed, since the TCEQ’s enforcement policy treats multiple company violations as just one under the $10,000-per-day state cap on penalties. Both he and former TCEQ commmissioner Larry Soward, who is now advising the Galveston-Houston Association of Smog Prevention, believe each violation should be counted separately. Cyrus Reed, conservation director for the Lone Star chapter of the Sierra Club, says the TCEQ’s guidelines for assessing penalties prevent the agency from recovering at least the amount of the economic benefit a company gains for polluting. “The agency generally doesn’t consider the economic benefit that the violator gains by not complying with the law,” Reed says, although the TCEQ disputes that: When companies gain an economic benefit of more than $15,000 from failure to comply with regulation, Clawson said, their penalties are increased by 50 percent. So where are the greatest number of enforcement actions? 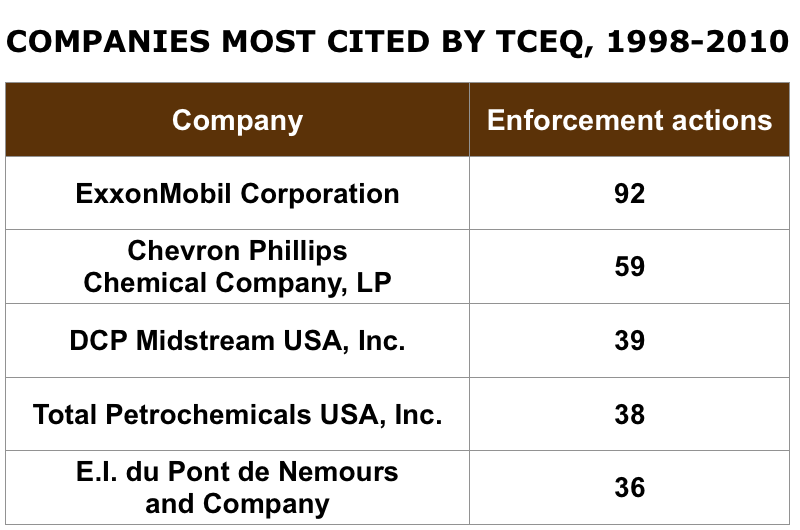 Not surprisingly, companies in Harris County — a hub of the petroleum industry — were subject to the most administrative and the court-ordered enforcements (a more serious class of regulatory actions in which the TQEQ sues the violator) over the last decade. Harris County had more than twice as many administrative orders (1,832) as the county with second-highest number, Tarrant County (588), according to TCEQ records. More than 1,000 of those Harris County citations were for air quality or petroleum storage tank violations. Companies in Harris County garnered a total of $92 million in court-enforced penalties in 153 different court cases, the records show. By contrast, a single case in Chambers County resulted in a $300 million court-enforced penalty — more than half of the total that companies across the state have paid since 1998. In December 2003, Bell Point Refining, L.L.C., was ordered to pay that amount for industrial hazardous waste violations that included discharges from industrial waste drums, failure to properly label containers, lack of secondary containers and failure to submit an annual report of material on the site, Clawson said. In an apparent enforcement success, Bell Point Refining was eventually forced out of business by the penalties. The record of court actions makes it difficult for a violator to acquire property, says Tom Kelley, a spokesman for the Office of the Attorney General. How eager is the TCEQ to go to court over violations? Not very, critics charge. Most cases that end up in court do not originate with the agency but rather with county attorneys, says Rick Lowerree, an Austin attorney who frequently takes on environmental cases brought by citizens against polluters. The agency would prefer the work the cases themselves and handle them quietly under administrative processes, with lower penalities, rather than haul companies into court, Lowerree says. “Very few [court orders] are things that TCEQ initiates, because they rarely refer anything over to the attorney general’s office,” he says. TCEQ spokesman Clawson said the agency has, in fact, referred several violators directly to the attorney general’s office. He cited the agency’s referrals of the Goodyear Tire & Rubber Company, for air emission violations in August 2008; CES Environmental Services, for air and waste violations in July 2009; and BP Products North America, for air violations in June 2007. Yet Rock Owens, chief of the environmental division in the Harris County Attorney’s Office, says all 26 of the court-ordered enforcement actions in the years 2007, 2008 and 2009 originated with investigations by his office. “With the [TCEQ], you have the appearance of enforcement, but I don’t think there’s any teeth in what they do,” Owens says. Cases brought by Owens’ division included an August 2008 order against Louisiana Gas Development for an on-land well that spewed oil and gas for three days and a July 2008 order against Intercontinental Terminals Company, a petrochemical transit company, for air emissions. In one ongoing case he’s pursuing against Intercontinental, the company is alleged to have spilled three cases of the chemical Toluene in a ditch in Harris County. Owens sued Intercontinental just before they were to reach a settlement with TCEQ for administrative enforcement. Owens thought the penalty was too small, and the agency agreed to withdraw the settlement. The most-cited polluter in Texas over the last decade is global juggernaut ExxonMobil, which has been hit with 92 administrative enforcement actions by the Texas Commission on Environmental Quality — more than any other company operating in the state, according to records provided to The Texas Tribune by the TCEQ. Since 1998, the earliest year for which TCEQ's electronic data is available, the agency has levied a total of more than 13,000 such actions and more than $140 million in penalities, its records show. In the same time period, the agency has pursued 520 cases through the courts for a total of $588 million in penalities. The TCEQ has boosted the number of enforcement actions against polluters since being blasted in a 2003 state auditor’s report for slow, sloppy enforcement and low penalties that provided little incentive for compliance. From 2000 to 2004, the TCEQ handed out an average of 859 enforcement actions per year. For the second half of the decade, that number rose to 1,544 actions per year, the agency's records show. But the TCEQ still faces criticism from environmental groups for levying penalties too small to curb pollution. ExxonMobil, for instance has paid less than $1.5 million in fines since 2001, those records show, or an average of just $158,000 a year — a mere pittance for a company whose annual revenues in 2009 were $19.42 billion. Environmentalists and other critics charge that with so little an impact to a polluter's bottom line, no real deterrent to future violations exists. “Fines are routinely less than the economic benefit of noncompliance,” said Luke Metzger, the director of the advocacy group Environment Texas. Questions over whether the TCEQ conducts enforcement with sufficient fervor take on increased significance as the company last week became embroiled in a tussle with federal regulators over it’s role on the front end of the regulatory process: permitting. The Environmental Protection Agency last week stripped control from the TCEQ over one of its biggest permits — a plant in Corpus Christi owned by Flint Hills Resources, the fifth biggest refinery in Texas [changed order]— because it alleges the state’s “flexible” permitting process does not meet federal anti-pollution standards. Specifically, the flexible permits give facilities a cap on total emissions but do not require the tracking of emissions by individual units within that facility, which may allow them to violate federal clean-air standards, said EPA regional counsel Suzanne Murray. 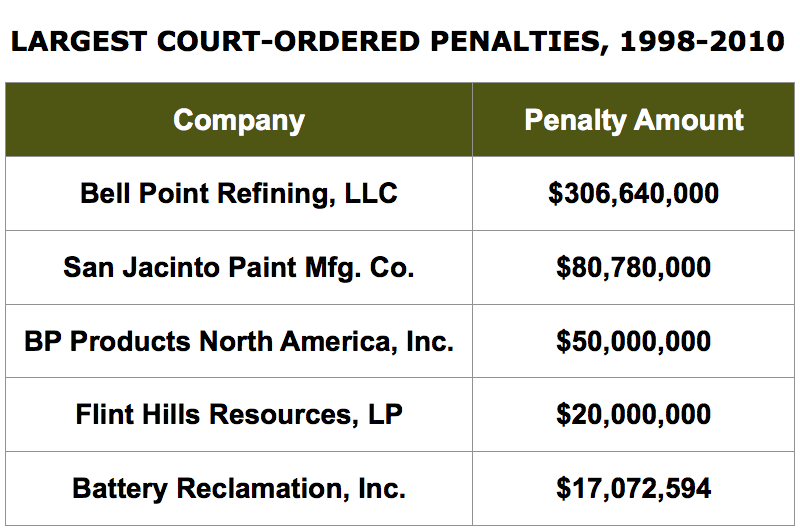 The TCEQ’s enforcement data show that the Flint Hills Resources refinery was assessed about $62,000 in penalties for air violations since 1998, all between the years 2006 and 2009 [just leave underlined portion?]. And a court settlement reached in April 2001 saw the company fined $20 million for several types of violations. The state’s top 25 violators, based on the number of administrative enforcement cases, consisted mostly of oil and natural gas companies, refineries and chemical companies. Debbie Hastings, vice president of environmental affairs for the Texas Oil & Gas Association, said the enforcement figures do not suggest any problem with industry pollution; rather, she said, they suggest an admirable track record given a Byzantine regulatory scheme. Metzger said examples of companies like Exxon piling up persistent violations show they are not being deterred from pollutions. In one well-publicized case, Exxon was fined $496,201 in 2009 for 23 different emission violations between 2005 and 2007 at three Baytown refineries. In one 2005 emissions event, more than 1,000 pounds of ammonia, 263,000 pounds of carbon monoxide, 900 pounds of hydrogen cyanide, and 11,000 pounds of sulfur dioxide were released into the air over about 17 hours, according to a TCEQ enforcement summary. Another problem with TCEQ’s enforcement policy involves the treatment of multiple company violations as just one — meaning multiple violations are captured under the $10,000 per day state cap on penalties, Metzger said. He advocates counting each violation separately, a reform also endorsed by former TCEQ commissioner Larry Soward (who is now advising the Galveston-Houston Association of Smog Prevention). Cyrus Reed, conservation director for the Lone Star chapter of the Sierra Club, said TCEQ’s guidelines for assessing penalties prevent the agency from recovering at least the amount of the economic benefit a company gains for polluting. “The agency generally doesn’t consider the economic benefit that the violator gains by not complying with the law,” Reed said. The TCEQ disputes that assertion. When companies gain an economic benefit from failure to comply with regulation, their penalties are increased by 50 percent, Clawson said, but only if the TCEQ determines that benefit to be more than $15,000. Not surprisingly, companies in Harris County — a hub of the petroleum industry — came in for both the most administrative and court-ordered enforcements, a more serious class of regulatory actions in which the TQEQ sues the company. Harris County had more than twice as many administrative orders as the next county: 1,832, compared with Tarrant County’s 588, according to the TCEQ data. More than 1,000 of those citations were for air quality or petroleum storage tank violations. But the total amount companies paid in court-ordered enforcement actions — $588 million — included a $300 million penalty levied in a single case in Chambers County, located in the Houston-Sugarland-Baytown metropolitan area. Bell Point Refining, L.L.C., was ordered to pay that penalty in a December 2003 agreement for industrial hazardous waste violations. Companies in Harris County, by comparison, garnered a total of more than $92 million in court-enforced penalties, but those penalties were meted out in 153 different court cases, according to the TCEQ data. The violations by Bell Point included discharges from industrial waste drums, failure to properly label containers and lack of secondary containers and failure to submit an annual report of material on the site, Clawson said. The company was eventually forced out of business by the penalties in an apparent enforcement success. The record of court actions eventually makes it difficult for the business to acquire property, said Tom Kelley, a spokesman for the Office of the Attorney General. “Very few of them [court orders] are things that TCEQ initiated, because they rarely refer anything over to the attorney general’s office where the attorney general would probably get very big penalties,” Lowerree said. The TCEQ’s Clawson said the commission has referred several violators directly to the attorney general’s office. He cited the agency’s referrals of the Goodyear Tire & Rubber Company for air emission violations in August, 2008; CES Environmental Services in July 2009 for air and waste violations; and BP Products North America in June 2007 for air violations. Rock Owens ((HIS NAME IS ROCK, NOT RICK?)) [Yep], chief of the environmental division in the Harris County attorney’s office, joined the division in 2003. He said all 26 of the court-ordered enforcement actions in the years 2007, 2008 and 2009 — nominally the work for TCEQ — originated with investigations by his office. “With the commission, you have the appearance of enforcement, but I don’t think there’s any teeth in what they do,” he said. Those cases brought by Owens’ division in the Harris County Attorney’s office included an August 2008 order against Louisiana Gas Development for an on-land well that spewed oil and gas for three days and another in July 2008 against Intercontinental Terminals Company, a petrochemical transit company, for air emissions. In one ongoing case he’s pursuing against Intercontinental, Owens said the company spilled three cases of the chemical Toluene in a ditch in Harris County. He sued the company just before they were to reach a settlement with TCEQ for administrative enforcement. Owens thought the penalty was too small, and the commission agreed to withdraw the settlement.